We made Chicken Salad with leftovers from Roast Chicken with Giblet Gravy. Adjust the seasoning to taste – Jim and I tend toward the salty side, but I was conservative with the amounts below. If not using leftover chicken, cook chicken breasts or mix of white and dark meat chicken. Let chicken cool and shred with a fork or chop into cubes. 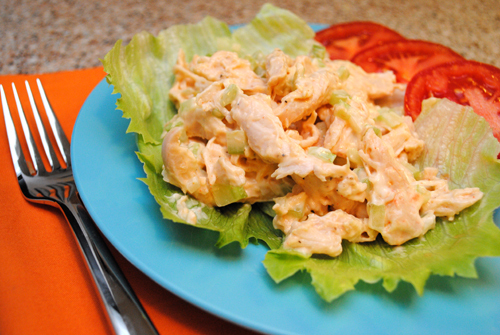 In a medium mixing bowl, mix the dressing and chicken, cover, and refrigerate. Let chicken marinate in dressing for at least two hours. Finely chop the celery and onion and set aside. Slice the tomato and set aside. Remove chicken from the refrigerator. Add celery, onion, mayonnaise, salt, and pepper, stir to combine. 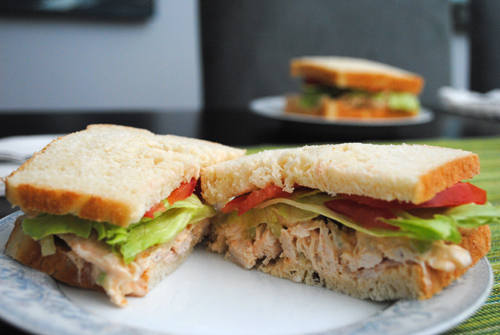 Serve chicken salad with lettuce leaf and tomato slice, alone or on bread for sandwiches.